In sports, in competitions, for fitness. NO Doping: officially approved. More attentive and alert when driving the car. More concentration, better performance when working and studying. How can HYPERGY work so ultrafast? are blended in an optimal combination. Due to the molecular structure of the HYPERGY pastilles, the contact to the mucous membrane is immediate; this ensures that the micronutrients quickly enter the bloodstream. Glycerin is the catalyst for this effect. This interplay of components leads to an almost instant effectivity of a lower dosage due to its high bioavailability. 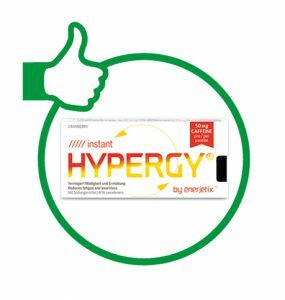 HYPERGY is a highly effective and healthy nutritional supplement -Energy product in pharmaceutical quality. 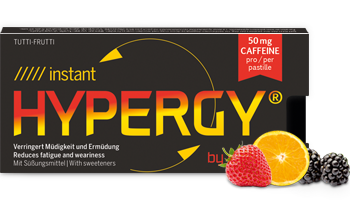 Any negative side effects of conventional sugary energy drinks are avoided with HYPERGY pastilles. Sugar is not forbidden for diabetics, however, it should not cover more than ten percent of the daily energy demand. The World Health Organisation even advises five percent only. 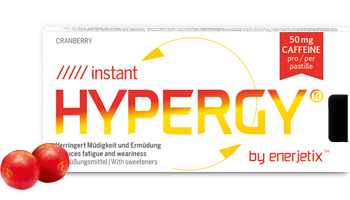 HYPERGY is free from sugar and that makes it suitable for diabetics. 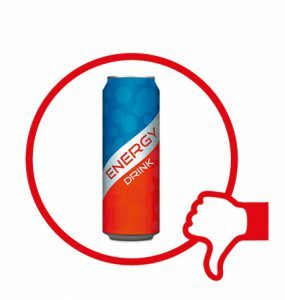 Buy four cans of energy drinks at the retailer today and pay approx. 13% more for them. Die HYPERGY Tutti Frutti flavor is a composition of aromas of a variety of fruits which optimally surround the caffeine, taurine and vitamin touch. Recommended consumption: Do not take more than 3 pastilles a day. The recommended daily dose may not be exceeded. Store cool and dry. Note: Do not substitute a healthy and balanced diet with this product. Keep out of the reach of children. Contains caffeine (50mg per pastille). Not recommended for children, pregnant women and persons sensitive to caffeine. Free from sugar and preservatives. The bitter-sweet-sour cranberry flavor is a very fitting complement to the active ingredients caffeine, taurine and vitamin B5. Ingredients: humectant glycerine, gelatine, inulin, thickening agent guar gum, caffeine, emulsifier soya lecithin, taurine, flavors, sweetener sucralose, sweetener sodium saccharin, menthol, calcium pantothenat. Plus, the performance enhancement effect only begins after up to 30 minutes. May lead to trembling and a racing heart in connection with extreme physical exercise. Attentive is defined as: paying careful attention to something, being mindful and observant. Alert is defined as: the ability to think clearly and to notice things. To be watchful and prompt to meet danger or emergency, quick to perceive and act. Endurance is defined as: The ability to do something difficult for a long time, the quality of continuing for a long time. (Merriam Webster)ung. The sweeteners used in HYPERGY (sucralose, saccharin, sodium) make them particularly suitable for diabetics and, of course, for people who aim at avoiding sugar in their diets. Preservatives in foods and nutritional complements are not desirable. This is why HYPERGY avoids preservatives by employing a special manufacturing method, called Soft-Gum Technology, enabling stability and a special combination, free from preservatives. Improving your performances and capabilities is something very much engraved in us humans. We always strive to tap our full potential and push the limits. 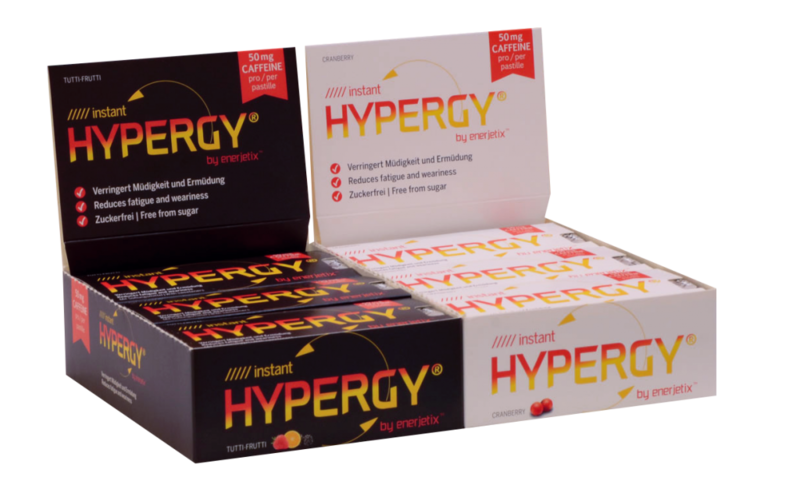 Hypergy is sold in Germany and Austria exclusively in pharmacies. Please order them with the central pharmaceutical number in your pharmacy.